Do you love comic book heroines? Amanda Conner brings Red Sonja to 3D life! The She-Devil with a Sword is sculpted by Jason Smith. This bronze edition is a limited edition of only 299 pieces! If you love comic book heroines, you undoubtedly love Amanda Conner, whose illustrations have brought beloved characters Harley Quinn, Vampirella, Power Girl, and (of course) Red Sonja to life. Dynamite Entertainment now brings this fan-favorite artist's vision of the She-Devil with a Sword to three dimensions with this hand-painted resin statue! 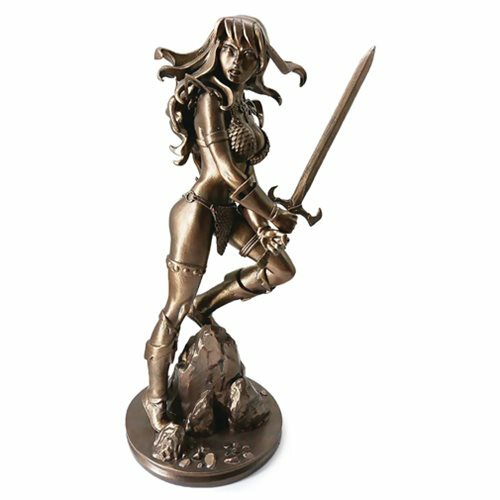 Based on Conner's cover artwork for Red Sonja: The Black Tower #1, the superb Red Sonja by Amanda Conner Bronze Limited Edition Statue is sculpted by Jason Smith, measures approximately 7 1/2-inches tall, and stands on a 3-inch wide base. It comes with a numbered certificate of authenticity and is packaged in a full-color display box. This bronze edition is a limited edition of only 299 pieces! Ages 15 and up.